This week’s edition of “Who Takes It?” turns our attention on tonight’s UFC lightweight title bout between champion Rafael Dos Anjos and challenger Donald “Cowboy” Cerrone at UFC on Fox. It’s the second meeting between the two — and according to “Cowboy,” it couldn’t happen at a better time. Well, according to Cerrone, tomorrow night in Florida, Dos Anjos will face an opponent he didn’t have to cope with back when the two met in 2013. And no, not a “new and improved” Cerrone — although, that may be true too. The longtime contender has won eight straight bouts in the UFC since suffering a decision loss to Dos Anjos in Indiana. No, Cerrone was quoted recently remarking that he expects Dos Anjos to struggle with the UFC’s new drug testing regimen, with random testing conducted by the United States Anti-Doping Agency. 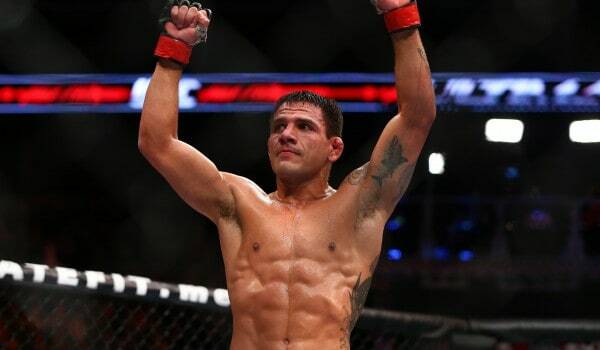 Dos Anjos responded by noting he had never tested positive for any banned substance. We’ll see what he says afterwards, indeed. Maybe it will play a factor, but it’s hard to predict that. What’s easier to predict is that there’s going to be a pretty good scrap between these two. The fight will be Dos Anjos’ first defense of the UFC lightweight championship. Back in March, the Brazilian scored what was seen as an upset victory against Wheaties cover-boy Anthony Pettis. He pressured Pettis with an improved stand up game throughout the bout’s five rounds, dictating the pace with a particularly sharp 3-2 combination — and essentially facing down and beating up the guy we all regarded the division’s best striker. Perhaps the most important lesson to take away from this fight is that Rafael Dos Anjos doesn’t have a whole ton of tools on the feet, yet he picked apart the consensus best striker in the division. Strategy and ring position are far more important than number or length of combinations. Perhaps Dos Anjos will be that rarest of champions—the one who, rather than presenting a problem, comes in to solve them. A different fighter in every fight. We can hope. Although Dos Anjos leg-kicked Nate Diaz into “living death” (to borrow a phrase from Ken Shamrock) last year, he’s mostly been known as a jiu-jitsu man with wild punching power. His improvement as a technical striker in recent years, seemingly one step ahead of the competition at nearly every turn, has been a sight to behold. But can he continue that dominance against Cerrone, whose precise striking has earned dozens of wins in both Muay Thai and MMA? The feeling here is yes. Looking through both fighters’ recent bouts, you’ll find both get caught a bit… including against one another. Cerrone was also memorably stunned by Edson Barboza, before rallying to drop the feared Brazilian striker — and eventually finish him with a rear naked choke. Maybe something similar could happen tonight. All “Cowboy” has done is clean out the division. But there’s something about this new, improved “RDA” — something that tells me he can just keep walking through opponents with crisp striking and good all-around skills. It’s something that tells me we’ll need a special athlete to beat him… someone who doesn’t do everything by the book. In their first bout, Dos Anjos was content to match Cerrone’s quickness and striking on the outside. The Brazilian won a competitive bout that night, with his hand combinations (particularly the straight left/right hook combination, which scored a knockdown in round one) the deciding factor. A late Cerrone rally wasn’t quite enough to sway the judges. I see Dos Anjos stepping up the aggression here, and this time it won’t be quite as competitive — but it will be fun while it lasts. Watch it to play out similarly to the Pettis bout, but ending with Cerrone falling by fourth round TKO as the strikes accumulate, both on the mat and standing.